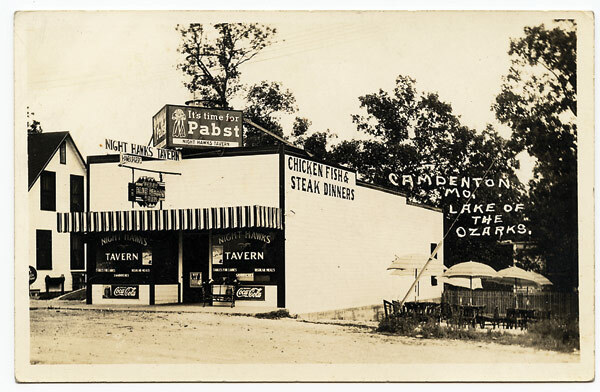 Toots and Jack Stotler operated this thriving business from 1933 until selling to Buford and Anna May Foster in 1945. The Fosters changed the name to Night Hawk Café. A stunning large neon sign with a flying night hawk whose neon wings flapped hung over the sidewalk. The parents of Leland Payton, senior author of Damming the Osage, went on dates to the Night Hawk, driving in from Versailles. Highway engineer Louis Payton rented a room in Versailles and met Ann Lewis Daniels at the Baptist Church. I worked here one summer while in High School. How cool! That was a classic space and a great commercial neon sign. Do you have any photos? No, I don’t have any photos.